1/Lt. Donald M. Fox (Pilot) swapped places with Cpt Barney R. Olive, A/C of Crew #3917 in order to allow Cpt Olive to gain combat experience with an experienced crew. Cpt Olive (Pilot) was assigned to Crew #??? and was replaced by 1/Lt Duane T. Darkenwald from Crew ???. 1/Lt George E. Little (Bombardier) was transferred to Crew #3915 and was replaced by 1/Lt James E. Gentry. S/Sgt Thomas F. Keenan (Radarman) was transferred to Crew #3906 (replacement) and was replaced by 1/Lt Wilbur M. Barner. On March 4, S/Sgt James R. Clark (Radio) was wounded severely enough to be sent home. He was replaced by S/Sgt A. F. Del Signore. The original members of Crew #3901 prior to deployment. Note that the men are wearing a squadron insignia, possibly of their own design - a tiger with an extruding lightning bolt. Photo courtesy of Allen Richardson, son of S/Sgt. Robert F. Richardson. Standing - Left to Right: 1/Lt George F. Norris (Engineer), 1/Lt Frank J. "Dash" Daschbach (Navigator), Maj John C. "Bulldog" Layson (Airplane Commander), 1/Lt. Donald M. "The Fox" Fox (Pilot), 1/Lt. George E. "Barrel" Little (Bombardier). 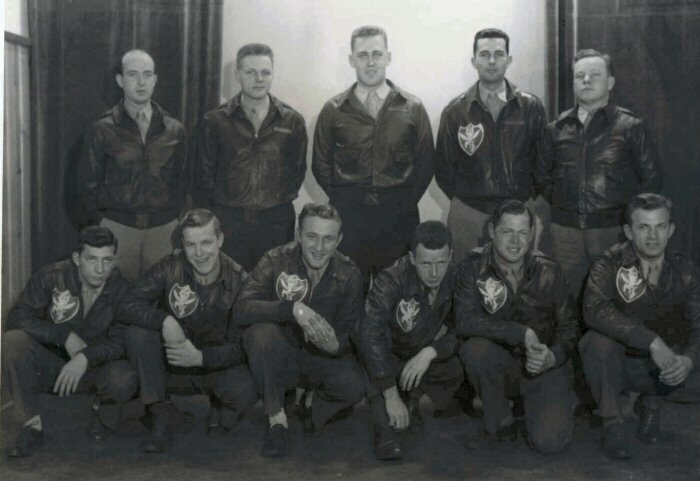 Kneeling - Left to Right: S/Sgt Delbert W. "Duck" Welker (Left Gunner), S/Sgt Robert E. "Bob" Potter (Tail Gunner), S/Sgt Robert F. "Ranger" Richardson (Right Gunner), S/Sgt Thomas A. Kennan (Radarman), S/Sgt James R. "Red" Clark (Radio), T/Sgt Stanley T. P. "Steve" Maciag (CFC). This crew generally flew "Grider Gal".